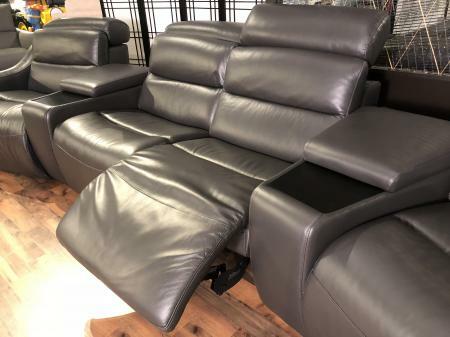 This model was especially manufactured as a trade prototype for La-Z-Boy and is upholstered in full soft sumptuous high grade charcoal craftsman genuine leather. 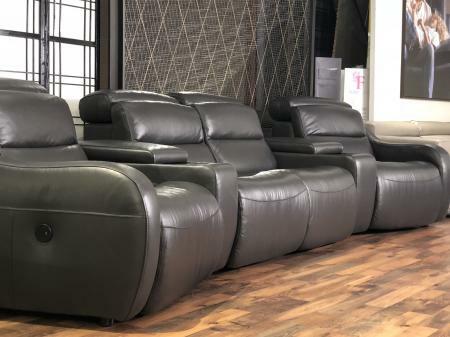 Features whisper quiet electric recliners and headrests on each ends with manual headrests and parachute recliners on the middle seats with three drinks holder / storage units. Modular design so that pieces can be removed or added to give the perfect size for your home cinema room. Full high grade leather all over, amazing pocket sprung seats for that extra comfort.